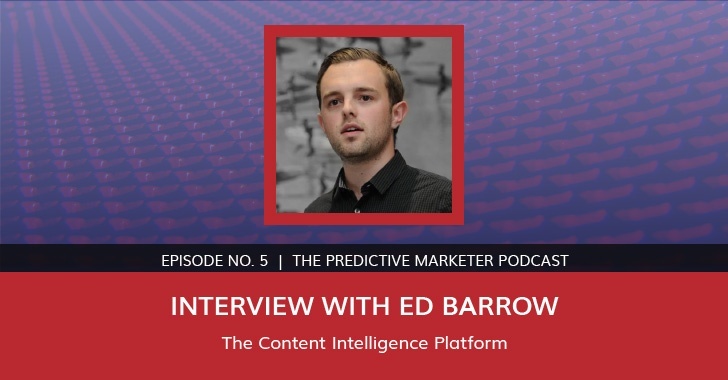 In episode 5 of The Predictive Marketer we're joined by Ed Barrow, CEO and Co-Founder of Idio. The Idio Content Intelligence Platform leverages unstructured content data from visitors digital content interactions, to provide businesses with rich customer insight that can tremendously inform content marketing strategy. Steve: Please start us off with the story of how you came to start Idio. Ed: Sure! It's a good story. So Idio actually goes back through my personal background three generations. So I'm third-generation predictive analytics which I think is a relatively unique thing in the world. So my grandfather was a pioneer around analog data processing, so he developed radar for submarines, not sonar this was the ability for submarines to detect what was above them in the air once they are underwater. So this is going way back in the earliest days of really trying to understand, from data, what signal you can gather from the noise of some very, very early stage data processing to predict, in that case, some very important things. And then stepping on to the next generation, my father was the founder and sort of patent holder around a company called KiQ which he founded predictive analytics startup in the mid-90s. And they were the pioneers of ‘next best action’. So if you phone your retail bank or your cellphone provider these days and said “I wanna leave,” what they offer you on the phone is predicted by that system. And now, that system was sold to a company in the US called Cordiant and in turn to Pegasystems, so they are now the preeminent enterprise predictive analytics platform providing the next best offer, the next best action for all the main retail banks and telecom providers in the US and across Europe. So I was involved in that as much as I could be at an early stage. So quite literally, I grew up in the environment of if you have the right data, you can pretty much predict anything. So yeah, that's my personal background. How Idio then evolved from that is when you're looking at what was happening in this next best action world in the largest enterprise organizations, we could see that a lot of values being generated by using information they held about your mobile phone contract or your cellphone contract and your age or income, your past transaction history and that kind of information within banking. And they would use that data to predict one of fifty to a hundred offers; a bundle for your cellphone, a new mortgage or credit card, similar things. And yeah, initially some really great results but I could see real limitations with the data that we're using. And for me, predictive marketing, predictive analytics was a huge opportunity but fundamentally, it relies on data. The data is the fuel for any powerful marketing optimization or more customer experience optimization. So around 2006, we looked at the environment that was out there, what was being done, the bleeding of predictive analytics. And at the same time, we saw an explosion of activity around digital. This was really in the transition time for a lot of people’s buying behavior. They moved from predominantly sort of transactional and human-driven purchase decision process to a much, much more online, self-empowered and content-centric approach to researching purchase decisions. And now, nine, ten years on, that's how everybody buys, for any considered purchased whether that's a piece of software, a financial service, products, a solution, you know, across a huge range of purchases; if you're buying a car or if you're buying a holiday, if you're buying a mortgage and then you have home or if you're buying B2B software or services. Content plays a huge part in that purchase decision. And it was through looking at that and realizing that behind that content consumption laid a huge pool of information of data that can completely change the way that traditional predictive analytics worked. And that's where we've come in, so we focused on unstructured data. So if you look at the world and how predictive analytics how works, it really at the very top, bifurcates into people building predictive analytics tools around structured information, you know, the existing first-party data that an organization has in its CRM system or in their transaction data versus people using behavioral and as a result, largely unstructured data. And unstructured data these days outweighs structured information five to one so it's a huge opportunity to change the way you optimize your marketing. And that's where we’re really focused with the powerful predictive analytics platform based on understanding people, people’s interests and then intent around the content they can choose. So understanding that, in essence, our belief which is “you are what you read” and using that unstructured data to optimize the delivery of the right piece of content at the right time to each customer or prospect. And then for an organization as a whole, to understand exactly what content needs to be produced, what campaigns need to be run in order to optimize the overall customer journey. Steve: Fantastic! I think it's very interesting that Idio appears to be alone out in this market place of predictive marketing providers, taking this approach of going after unstructured content interactions. So how do you explain that? Ed: Yeah, sure. I think when you look at predictive marketing tools, particularly in the sort of B2B space, the vast majority of them are using third-party datasets. And often the same data, Bombora or Maddison Logic kind of datasets that are out there. I think that if we step back, there's just been an explosion in predictive analytics. Two or three years ago, every startup was a data startup, they were saying, “Okay, we have this huge sum of data.” And I think the commoditization of machine learning tools and platforms that's out there, every new startup is a predictive startup. But the real challenge is it's one thing to say, “Okay, I'm going buy a bunch of third-party data and I can put our machine learning platform on top of that and I can churn through that data to provide new insight.” And I think that's what a lot of the new predictive lead scoring, predictive pipeline forecast tools are really doing. And I think people are doing that because it's relatively easy to get access to that information. And it's relatively easy then to apply some standard machine learning techniques and tools to build what can be quite useful datasets. But ultimately, I think the whole thing is going to be heavily commoditized. Everybody is buying the same data; everybody is applying roughly the same processes for doing that. So they're taking CRM data and the third-party data and together, running them through some fairly standard models and coming up with results. We've said if everybody has access to this third party data, is that really predictive? Is it powerful when it comes to your individual business? And actually, it's our view that knowing that sort of heavily inferred, heavily standardized and anonymized data isn’t really that powerful about understanding an individual prospect, an individual customer or account, and what they're likely to do next. It goes back to the days of using, from a B2C perspective, using sort of axiom or experion segmentation data that’s so heavily inferred, that frankly, it might as well be horoscopes. You're using completely arbitrary data like the day someone was born or the industry they're in or their job title and their company size to try and predict what’s right to talk to them about. And it's so standardized and diluted as a result. So we said you know, actually, what's someone is doing in your website, what someone is doing within your marketing is the best source of customer intelligence. It's a very, very simple transaction you're having with the customer. Every time they're interacting with a piece of content, you're providing them value, you're helping them make a decision and you can learn from that at the same time. The challenge is that data is a mess. It's not convenient to get to in terms of you obviously need to access that data directly from the website and do so very quickly. Real time analysis is very important. And it's also unstructured information. So you’ve got a clip on the website, a clip in an email, a transcript of a phone conversation or a chat log; these might as well, you know they're different channels and there's a silo problem about using data from different channels, but the data set might as well be in languages. It's so unstructured and diverse. So we really said, “Let’s make the extra effort to be able to understand that data first before we apply our predictive tool to it.” So it is pretty unique, I think, out there to be using the sort of the techniques and processes that we have. I think underlying what we do is a technology platform that I think there's only really one comparable set of technology out there that can do what Idio does. And that's actually the IBM Watson platform that you might be familiar with. That is their new, big artificial intelligence play that they’re launching at the moment. It's been nearly a billion dollars, I believe, getting that business unit up and running. And you know, if you're a colossal organization that wants to spend eight figures and twenty four to thirty six months to get this up and running, I think IBM Watson might be good for you. But if you wanna see results today -- and I literally mean today, and if you wanna do that on a scalable SaaS basis for smaller businesses, you know, we're really the only company out there I think that's taken on the extra challenge to use that unstructured data and really make value out of it. Steve: Well, like you mentioned, last twelve, eighteen months, the explosion in predictive marketing, correct me if I'm wrong, but something like three hundred million has been invested in that space? Ed: Mh-hm. From how I see it. Like I said, you’ve got a bunch of companies fundamentally buying the same data and applying roughly the same techniques and processes, it's a very fast commoditizing vertical at the moment, which is dangerous for all of these startups, and all the investors involved. But there's a raise to the bottom in terms of pricing. And I think that what you'll find is a lot of the traditional marketing automation and marketing cloud platforms will start to develop their own predictive marketing capabilities, either through purchase or through build. But I think that that can sort of consolidate and collapse in on itself pretty quickly. Which is you know, they aren’t valuable parts of the overall platform. I think if you’ve got an automation tool, bringing in predictive analytics to optimize the pipeline or to help you prioritize your activities are very, very important. But I think what we do is somewhat more tactical solutions and what we've said is actually being able to reprioritize your leads, for instance, is a great tool. It means that if you’ve got a hundred hot prospects or hot accounts, you can make sure you focus your time on your top ten. But from our perspective, that simply means that you're probably going to screw up with the most important leads slightly faster than you did before. You still don't actually know what to say to them. And what from what we believe, marketing is the best, as I said, the best source of customer intelligence. It's the best way to understand your clients if you actually really understand them on the basis of what they doing within your marketing environment. And being able to answer a really critical question which is “why?” why is this customer on our website or this prospect interacted with us? Why are they interested in our solution? Why should we call them? Or why should they call us?” And I think a lot of people would spend time looking at the “when” and the “where” and the “what.” But actually, answering that “why” question, that sort of understanding of the customer context I think is really, really important. And once you have the understanding of why they're interested in your solutions and in your services, then it's much, much easier to apply and act on that data to have a much more personalized marketing experience. Steve: Right. I couldn’t agree more. So why people read a piece of content is key to being able to market effectively and it's the missing piece in the equation right now. Ed: Absolutely. And I think the other thing is with a lot of predictive marketing tools, they're black boxes, right? You put in your CRM there or your marketing automation data in, they probably bring some external information in, they churn through that and tell you, “Okay, great. These are the leads to focus on,” or “this is what you need to send to these people.” And I think for a lot of organizations, it's really hard to judge how they made that decision. And therefore, either have confidence in those results or be able to judge comparatively between two solutions, which one is the better tool. So what we like about the Idio solution is actually, it's a box but it's a transparent box because what we do is we take your data and first process it to create these interest verticals, these individual tag clouds if you will, of what is this person interested in based on the content they're consuming? And then we turn that into recommendations of “this is the most relevant piece of content to inject into an email, into a website” or “this is the most likely conversion action they're going to take.” We output some of the same sort of data points, same sort of actions but it's very easy to see the logic of how the systems develop that and as a result, you know, it's much more comforting to look at predictive results and say, “Okay, I can kind of see how it's managed to make that decision. I think that's a good thing to put in front of our customers.” And of course, that's, at the individual level, then the data about what they're interested in answering that “why” question has a much broader impact, not just on the individual marketing execution, but for your strategy overall. You can really see what is the demand and the supply for your marketing at a topic level across all channels. And having that sort of insight paired with predictive tools that can action data creates a really nice combination of clarity over what you should be doing in a strategic level with an ability to action that scalability on a one to one basis. Steve: Well, let’s talk about the market a little bit. You guys are working with Fortune 500 or 5000, I believe. You’ve been working a lot with the financial market. Is that accurate? Ed: Yeah. So we work towards the enterprise end of the spectrum. And financial services and B2B software and services predominantly. So really, we're focused in on organizations both in terms of vertical and scale that have really put content at the center of their marketing. So really, it's those people who already implemented the marketing automation system have got the basics of that orchestration up and running. They’ve got their DRIP programs and they’ve got their lead scoring and so on, also set up but have realized that actually, marketing automation systems are very hungry – very hungry systems for content. They don't work unless you’ve got the right content. And the challenge is that once they can send a nicely coordinated DRIP program. They can’t actually tell you what to put into that communication. So they can’t really help you understand what should be in this email from a content production point of view. And they certainly can’t really get down to the granularity for each individual what's the right piece of content. And you know, as people started to scale by marketing automation and create a more segmented and personalized experience, the implementation and maintenance effort just goes exponentially through the roof and that's the sort of client we focus on. So B2B software and services have been really, really… the first movers in terms of implementing marketing automation in that sort of post marketing automation hangover environment these days. And as a result, it's a very powerful area for us to focus and so much of their marketing is now quite rightly based around delivering content that aids the purchase decision. And then in financial services, particularly having the sort of asset and wealth management side, for these businesses, content is actually more important still. It's not just a marketing tactic and a marketing technique; it's actually core to that business operation. You know, if you're an asset manager or wealth manager, you're dealing with relatively commoditized products; your underlying offerings are very similar to your competitors and to new entrants into the market. And so what you're really trying to do is demonstrate to your prospects and customers, your level of expertise in the market and develop through them appreciating your level of expertise, develop trust, that what you have in the market is better than your competitors, better than the customer and you really build that close relationship. And the primary way in financial services to do that is through delivering content research reports, investment analysis, market analysis. And it's a colossally expensive activity for them, producing this material, running a very large-scale, in many case, a very large scale insight and research teams and then distributing that is a phenomenally expensive task. So we really help them at an individual level, drive content engagement, drive people through understanding investment opportunities or market information and changes in the market and create a pipeline that move faster, basically. And at the end of the day, financial services and software companies just want more leads faster. So you know, we can really help facilitate that through the content delivery. And the second side is from an organizational perspective that you know, typically, when we start working with clients, and I think this is industry-assisted, that sixty to seventy percent of the content that gets produced never gets used. And it's a phenomenally expensive activity. So when you look at what is it that fuels a marketing automation platform or fuels a modern marketing experience, it is content. And if you're wasting the majority of that budget and that resource and time and effort producing the wrong material, purely from an organizational perspective, getting that right is really important. And Idio has had great success with both of those verticals in dramatically improving the content utilization. So that's by predicting what's the right piece of content produced in the first place and then making sure you get that content in front of people who really need it, can take that number from your sixty percent on these down to sort of ten or fifteen percent unused content. And that has a dramatic impact on your cost models, as well as obviously driving more leads faster and driving up marketing effectiveness as well. Steve: I wanna ask this question here because you're really in a very enviable position; you're leading a company that is a one of a kind company in an exploding market. How would you address the opportunities across different verticals and perhaps even mid-market sized companies? Ed: Absolutely. Well, yeah, I mean as you say the market is exploding and I think we got a really good opportunity. And you know, in an environment like that, you have to focus otherwise you can be distracted by a million different opportunities and prospects and so on. And you know, in an exploding market where there are you know, a vast number of new entrants getting cut through and getting a clear message out there requires that focus. So I think that's where we've started is it's definitely not where we're going to end. So we really look at a spectrum of clients. So you know, we've started at the higher end of financial services and software in terms of the typical client value; so the lifetime value of an end customer, we’ve started in a sort of institutional and investment banking, asset managment, wealth management area. These are really the sort of organizations that have a really high lifetime value of customers and as a result… or they have a high lifetime value of customers and also what I would really pass as a considered purchase. If you're going to buy into that, you're going to spend some time researching that purchase decision and therefore content is very important. I think what you'll see is an evolution over the next few years of sort of going down the spectrum in almost every vertical where content is going to become increasingly important part. So moving through financial services from asset management through wealth management to private banking into private health insurance and commercial insurance into commercial banking and ultimately into retail banking. And the same thing in software you know, at the moment, it's the sort of the enterprise end of software that have invested time in producing content but I think you know, seeing that very fast move down into mid-market and SMB. And really, there's a lot of other verticals out there on a B2B perspective, B2B consulting and services, and B2B telecoms, markets are really, really right for this. And then in the consumer in the B2C space as well, at the moment, I think there's going… it's early days but I think you'll see an explosion in the use of content and then the necessity of your predictive marketing and marketing content intelligence as we call it. I think we'll see an explosion in that area around travel and automotive. I think the purchase journey for travel, for booking a holiday or buying a car has already started to shift both in online content-centric and purchase decision. And so that's going to be great for us. And yeah, I think it's probably going to be some time before we see CPG companies moving into this area, although they use content in a very different way, they actually invest in a lot of content from an awareness point of view which is slightly different. So yeah, the world feels somewhat like our oyster in terms of the opportunity and the verticals. And really, you can see that transition. I think what's also going to happen is you need to look at the market that's evolving around software as a service as well. And I think you know, up until now, the large software as a service players like SalesForce and Marketo and the Oracle Sales Cloud, these are being deployed in sort of mid-market and the lower end of enterprise. So when they’ve deployed at telecoms, it tends to be the B2B side of business on any financial services, predominantly being the B2B sort of asset management size. I think what you'll see is that that's going to evolve quite quickly in the next few years and they're going to get into true enterprise scale clients. So the B2C side of financial services, the retail banking and the B2C side of telecoms. And we already started to see that. They're already making some great headway in those and challenging the larger, on premise implementations. In those environments, content as I said, at the same time is becoming an intrinsic part of the customer experience. And you're dealing with incredible scale; you're dealing with north of ten million end customers. And when you're dealing with that volume of customers and therefore, that complexity of a customer journey, you cannot facilitate a good customer experience without using predictive tools. And that's where I think you’ll see some huge implementations, hopefully for Idio and others like us. Steve: That's great. That really is exciting. Let me ask you this: what kind of growth plans does Idio have for 2016? Ed: Well, we're doing the classic, we're doubling a lot of what we're doing in the sales and marketing and customer success part. So we're really investing now in the commercial side of our business. We have a very, very successful, highly skilled team of developers and data scientists in London. And I think we've got a great position to have such a small but successful team there. So we're really investing now in our commercial operation, both in Europe but also here in the States, at the moment on the East Coast. And as I said, keeping focused on the verticals we have at the moment. But 2015 has been a phenomenal year for us in terms of growth and I see that 2016 is going to be far better, actually. We're already seeing that from our own platform forecast. So I think from where we are, we see this market growing. I think predictive marketing is going to move to center stage in 2016. I think marketing automation is going to take a step back, as people realized that, you know, essentially, they need to move beyond standard workflow tools to really try to understand their customers. And customer intelligence is at the heart of a lot of predictive marketing and so I think it's going to move to center stage and I'm hopeful that the market will see that there's a big difference between using commoditized data and standard tools, compared to really understanding your customer based what they're doing with you as a company. So yeah, I'm really excited about where it's going to go for Idio over the next year. Steve: You know, right now, there's competitive advantage of using your technology. At some point, everybody starts using it and you have to use it to be competitive. Ed: Yeah. I think it's interesting that these days, if you looked at the CRM solutions and the next best action based solutions being used in the industry, you'd actually find that every major retail bank and every major telecoms in the US is essentially using the same platform. It's fascinating to see that you got companies that are providing essentially the same products and are now using essentially the same CRM and predictive analytics tools to offer those. And I'm confident to expect a similar thing with content intelligence. So yeah, absolutely. At the moment, we've got some really, really successful pioneering clients that have taken the huge leap forward. And I've seen some great returns as a result and we've seen as a competitive advantage. We've also got people who are saying, you know, normally they don't put the cart before the horse and move quickly but when your competitor has the cart, maybe you need to move faster. So I think that there will be a snowball effect. And we're certainly starting to see the early signs of that. But I think what's interesting and contrasting what we do with other predictive marketing tools, you know, because our system is powered by your own data about how your prospects are interacting with you, once the tool might be used by you yourself and all of your competitors, actually, the insight that it generated and therefore the predictions it can make a genuinely proprietary to you as an organization. In contrast to other predictive tools which ultimately rely on the same publicly available, licensable data that's out there. So I think that that's the case and we've seen it before with ‘next best action’ that you can actually still use the same tools as everybody else. But by leveraging your own interaction data, you have a proprietary data set at your disposal. And so two players in exactly the same market using Idio in exactly the same way could see quite different data sets. And that's one of the real unique things about what we do is most predictive tools take a standard set of data, either they're purchased or first first-party data, and then predict something on top of it. What we do is actually generate a new data set. We generate a new asset for the business and it's that asset that actually is at the core for what we do. Most of our predictive tools simply sit on top of that data to action it a real time in a scalable way. It's that new dataset that's propriety to each client that is the real innovation, I think, and means that at the moment, those that have implemented it are at a serious advantage, I'm confident to say. And I think there will be a snowball effect. But I think beyond that, it doesn’t really get into a commoditized position because of what's unique to each client that implements it. Steve: I think that's a very key point, the fact that you guys are creating proprietary dataset -- a huge differentiator. Let me ask you how do you see the future of marketing as we move forward? Ed: Yeah, I think that the each department of an organization over the last hundred years has gone through two sort of phases: one is an orchestration through technology. So you can track from the production line through HR, through sales, through distribution, you know, that initial phase of “let’s put the technology in to help manage the core part of the process.” And then steadily, the next phase is saying, “Actually, if we've got all of these data, maybe we can have technology action that information and not just humans.” And I think that's where marketing is going. So the first phase over the last sort of five or six years has been introducing marketing operating systems of one sort or another where in B2B, it's marketing automation tools and in B2C, it's this sort of large and more sporting marketing clouds. And so I think for those who’ve implemented those technologies, they are at a point where they now have a technology backbone to their marketing. And so I really see that the next phase being, “okay, we have these technology at the core, we now have a lot of data flowing around in our marketing; can we really leverage technology not just to coordinate the process but actually action that and predict that?” So I think predictive marketing, as I say, is going to move to center stage. 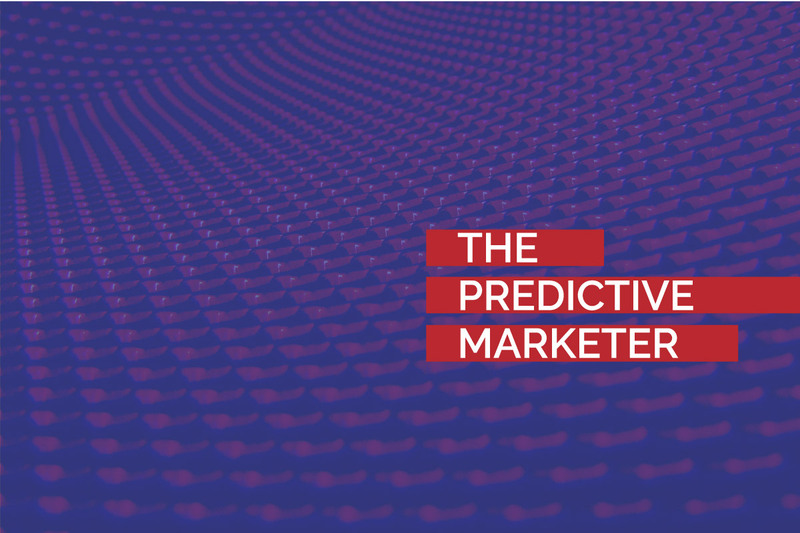 I think what really goes beyond predictive marketing is two areas: one is what people are calling “contextual marketing” which is saying that actually, using the customers’ context to provide a better experience is the core. And that's obviously where Idio comes in, answering that critical question of “why is this person engaging?” before launching the “what should we say to them next? And providing that context is really important. And there's a lot of other parts that you know, being able to answer when and where you should also communicate. And obviously, the proliferation of channels of communication really plays into that. And I think where marketing goes or where predictive marketing goes leads into where marketing is going which is I think marketing taking an increasing role across the entire customer journey. And I think that marketing can sort of act as the organizational skin that is there across the entire life cycle to do two things: one is to manage the customer communication, the customer experience but also to be that front line vehicle for understanding the customer. And I think what you’ll see is that marketing needs to evolve to be both customer intelligence and customer experience together. And the most successful organizations either combine marketing and service together and really make that a seamless experience between marketing and service. And I think what happened is that sales and you know, what has been a department, sales being a department that's been on the forefront for the last ten, fifteen years is going to step back and we're going to see a powerful combination of marketing and service, really managing the customer experience for the largest and also the most innovative organizations. At the end of the day, end customers are now so in control of the purchase process that they don't really need a sales rep to manage that across the line. They are making that purchase decision. They need support in making that decision and that's where marketing plays in. And then really, they wanna have a great experience. And I think a lot of values is going to be developed to help bringing marketing and service together with service really coordinating the internal delivery of knowledge in human resource and marketing acting as the corporate skin. Steve: Yeah, this has been fascinating. Thank you so much for taking your time to be with us today! Ed: Yeah, thank you very much! It's great to chat.